The Modern Term “Scapegoat” Comes To Us By Way Of? In modern usage, a scapegoat is a person blamed for some wrongdoing, mistake, or problem caused by another person and is, typically, punished in their stead. In a family-owned company, for example, workers not related to the family might feel uneasy when one of the owner’s children makes a mistake on the job because they fear the blame could be transferred to them and that they might be the scapegoat for the whole mess. Transfer is the proper word to use here because if you trace the term “scapegoat” back to its origin, you’ll find a special kind of transfer indeed. In ancient Judaism, the scapegoat was a literal goat that was ritually designated to symbolically take on the sins of the people during the Day of Atonement ceremonies. The High Priest would confess the intentional sins of the people during a ceremony, placing them figuratively on the head of the chosen goat, which would symbolically “take them away”. The goat would then be driven out into the desert as part of the ceremonies, taking the sins of the people with it. Today, even though most people are unaware of the historical context, it retains the general meaning with the person serving as the scapegoat often being driven from the community—typically a workplace or organization—to serve as the “sacrifice” that restores order. 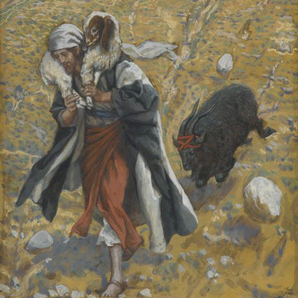 Painting, “Agnus-Dei The Scapegoat”, by James Tissot/Wikimedia.